If you think that camping is too rough for you, then why not try glamorous camping or glamping for short? You can still enjoy the finer things in life whilst enjoying the finest camping destinations in Australia. VroomVroomVroom has listed down some of the best places to go glamping in the country. Situated within the Margaret River Region, Mile End Glamping is the perfect place to enjoy the wildlife, river, and lush greenery. It also gives you easy access to some of the wineries and attractions in Margaret River, Busselton, Dunsborough, and Yelverton since these places are just approximately 15 minutes away via car hire. 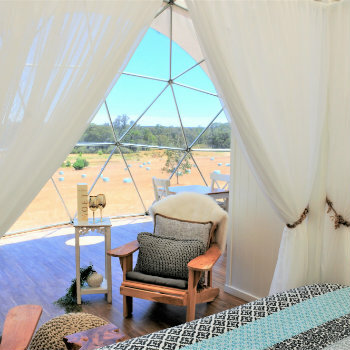 The geodesic domes are a sight to behold and it can fit up to two people which makes it perfect for couples looking for a romantic getaway. Each dome features a king-size bed, private bathroom and kitchen facilities to make your stay more comfortable. There is also an adjacent deck with a spa bath and BBQ area so you can soak up the Australian nature whilst enjoying these perks. Directions: You can rent a car in Perth and drive approximately 2 and a half hours to reach Mile End Glamping . It is located in 76 Yelverton Road. If you are, on the other hand, coming from Busselton, this luxurious glamping site is an easy 15-minute drive. Imagine waking up to magnificent views of the Sydney Harbour Bridge and Sydney Opera House. By staying at Roar and Snore, which is a safari-style accommodation located right in the heart of Taronga Zoo, you can experience this each morning. Their glamping tents feature a double bed and a single trundle bed. Each room can accommodate up to four people which is perfect for small families. There are also on-site bathrooms with showers and toilets. Directions: Roar and Snore is located at Bradleys Head Road in Mosman. It can be accessed via Taronga Zoo Sydney main entrance where your host will meet you. It is just a 12-minute ferry ride from Circular Quay. Guests can take advantage of their complimentary parking. St. Jerome's isn't your typical city centre hotel because they let their guests experience a different kind of accommodation right in the heart of the Melbourne CBD. 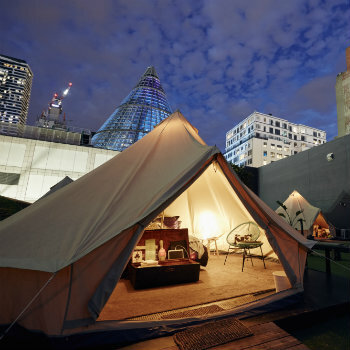 Instead of staying in a room, experience luxury camping by staying in their world-class bell tents located on the rooftop of the Melbourne Central Shopping Centre. Each glamping tent is equipped with a double or queen size bed, heater, a tablet loaded with a wide selection of movies, and complimentary drinks. Start your day with a gourmet breakfast box and coffee delivered to your tent. Cap up the night by stargazing and enjoying 360-degree views of the city's spectacular skyline. Directions: From Melbourne Airport, it will only take around 25 minutes by rental car to get to St. Jerome’s. The quickest route is M2, but you can also go through Pascoe Vale Rd or State Route 35 before taking that route. If you really want to experience the ultimate camping adventure without sacrificing comfort, then head to Nightfall. The campsite is nestled in a remote area near Lamington National Park called the Lost World. The pristine Queensland beaches are just around 45 minutes away via car hire from the glamping spot. There are only three tents at the camp to ensure privacy for guests and minimize the impact on the wilderness. Each custom-designed safari-tent features a rotating fireplace, plush bed and vintage bathtub. Indulge on complimentary wine and a gourmet platter or enjoy fire-cooked organic food. Directions: If you are coming from Brisbane or the Gold Coast, the travel time to Nightfall is less than two hours. From Brisbane, take National Route 13 and Christmas Creek Rd. For the ultimate bush camping luxury, head to Wildman Wilderness Lodge, which is situated on the outer edge of the Kakadu National Park and within the beautiful Mary River Wetlands. The safari lodge offers tours of the park and cruises on the river to bring you closer to the wilderness. There are several accommodation options to choose from including 10 stylish cabins and 15 safari tents. The cabins are air-conditioned while the tents are fan cooled. The romantic cabins which they call Habitats can accommodate up to two people whereas the Safari tents can fit in 4 to 5 people which is perfect for families or a group of friends. 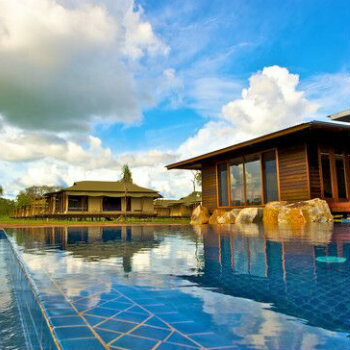 Enjoy their luxurious facilities including an infinity pool, restaurant and bar. Directions: Wildman is just a 2-hour drive from the east of Darwin via the Arnhem Highway and Point Stuart Road. You can take the same route if you are coming from Jabiru, which is just 160 km away from the campsite.